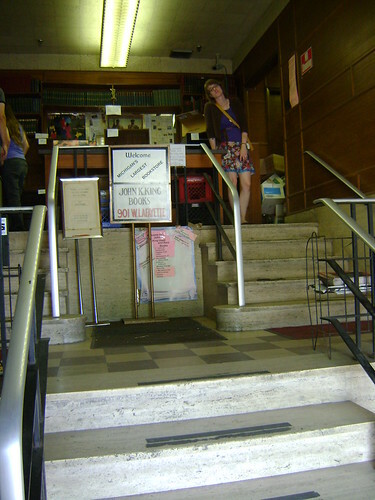 It's been a few weeks since sunnydecho and I visited John K. King Books, the "largest used and rare bookstore in Michigan." I mentioned it here, but not in detail, and the trip is... well, not haunting me, but maybe I'm haunting the bookstore a little, in my mind. Anyway, preaching to the choir, probably. 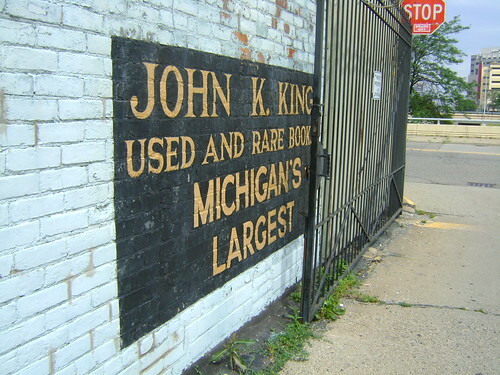 John K. King's Books, the main part of it, anyway, is in an old glove factory in Detroit. The lobby is unprepossessing. It could be any sort of lobby, were it not for the piles of books and boxes and milk carts, and crowded-in antiques. But it does seem vaguely reminescent of a public library--maybe the sandstone steps? That's Sunny, looking bored at me, on the right. Not so much drawn to scale, and all four floors are fit onto one sheet. We probably only hit up a handful of the sections. 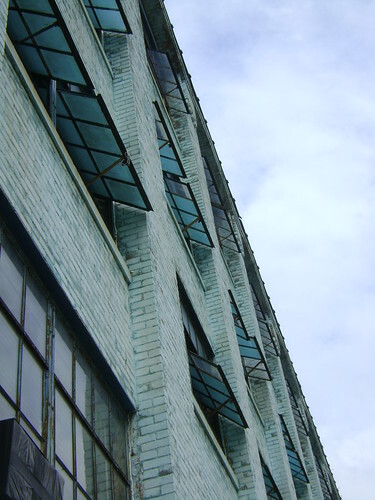 I hit Juvenile quickly, then up to the 3rd floor for paperback science fiction (past the charmingly named "warming stations"--I'm guessing the ex-glove factory is not heated in the winter; of course, the day we were there, a cooling station would not have been amiss). I checked out Hard Cover Science Fiction, too. 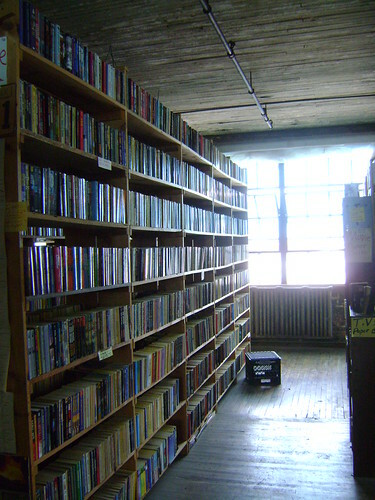 We went downstairs to the second floor--me for World History, Sunny for Fiction, before checking out. I also paused in the Reference section, wherein were housed a very creaky and unappealing selection of writing books. We spent well over an hour there, were totally overwhelmed, and left in a daze. It was not unlike my first trip to Powell's in that regard. We didn't even make it to the fourth floor! With the windows, radiators, and narrow ceiling + floor planks in the last photo, you can almost hear the old sewing machines clacking away. Great building + great bookstore.